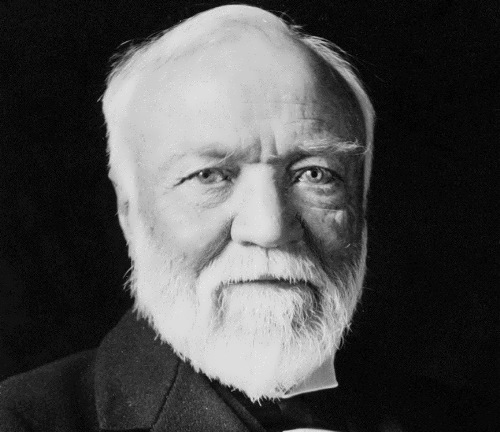 Andrew Carnegie was an American industrialist and philanthropist, one of the first ‘captains of industry’, leader of the American steel industry (from 1873 to 1901). Carnegie made the USA the greatest industrial nation in the world. Andrew was born on November 25, 1835 in Scotland into a poor working-class family. When he was 12, his family moved to the United States and settled in Pittsburgh, Pennsylvania. 13-year-old Andrew went to work in a cotton factory. It was a hard work – 12 hours a day and six days a week. Later he became a messenger boy in a telegraph company, and 2 years later a telegraph operator. At the age of 18 he became the head of the telegraph department in Pittsburgh. Carnegie learned much about the railway business from Thomas Scott, who also helped him with his first investments. In 1855, Carnegie invested $ 500 in the Adams Express. Carnegie slowly accumulated capital, which later became the basis for his continued success.